Skydiving Seattle – 20x Higher Than the Space Needle! Skydiving LocationsThe best places to skydive in the United States. Skydive Atlanta – Georgia on Adrenaline! Skydiving in Arizona – Just Don’t Forget To Breathe! Skydiving Las Vegas – Thrill is Not Just in Casinos! Skydive Chicago – Professionalism, Safety, Adrenaline! Skydive Hawaii – Jumping Over the Pacific! Home / Skydiving Seattle – 20x Higher Than the Space Needle! The Seattle area boasts some of the best skydiving facilities in the state of Washington. For first time skydivers in Washington State, it is also a great choice for jumping with milder weather and lower rainfall than some of the surrounding regions. Seattle skydiving centers offer tandem jumping, static line skydives, and solo freefall (with accelerated free fall training and certification if needed). When you are looking where to go skydiving near Seattle, there are a number of great choices including the Kapowsin Air Sports, Skydive Snohomish and Jet City Skydiving centers. Check our coupon link for local Seattle Skydiving coupons, often over 40% off for single jumps. And in case you were wondering, the title is accurate; skydiving Seattle really is 20 times higher than the Space Needle (which at one time was the tallest structure west of the Mississippi River). 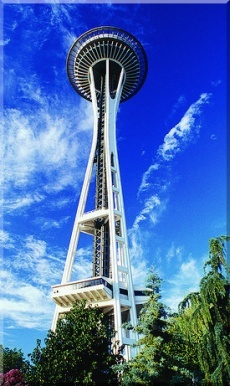 Seattle has a mild temperate climate and is not as rainy as many of the surrounding regions in Washington State. The city receives most of its rainfall from late fall through winter and early spring. You can skydive Seattle year round but the best months are mid spring through early fall (late April through early October). Between the months of October and May, Seattle is mostly or partly cloudy approximately six out of every seven days. Keep in mind that cloudy or overcast days will not necessarily disrupt skydiving. It is only the low clouds, fog, thunder, rain, or high wind (15-20+ mph) that will cause skydive cancellations. Most of the real rain in the city occurs during the three winter months of November, December, and January. Although some Seattle skydiving facilities will remain open during the winter, If you are planning a skydive in Seattle during this time then be sure to check our Seattle weather forecast (on the right of this page). During the Seattle winter, static line jumps can be the most popular because they require a lower altitude and can often be performed when the freefall jumps are canceled. 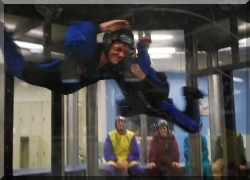 Indoor skydiving is also famous in Seattle. This may not be quite as exhilarating (or terrifying) as outdoor skydiving but it gives the same freefall sensation of floating through the air. Seattle indoor skydiving is safe, fun, requires minimal preparation, and can be done no matter how the weather is outside. If you want to try indoor skydiving, check to see if any indoor skydiving coupons are available and enjoy Skydiving Seattle!